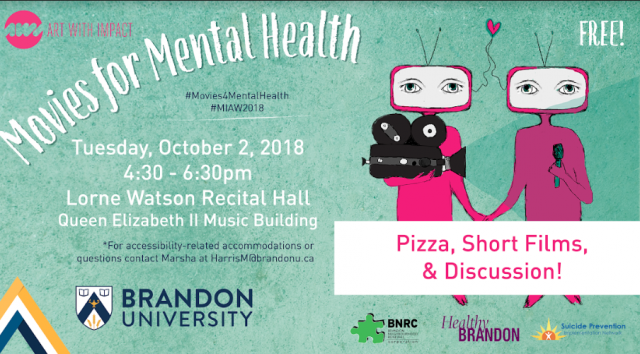 This upcoming October, Brandon University will host “Movies for Mental Health,” a workshop conducted in partnership with BU Student Services and the North American organization Art With Impact. The event will take place on campus on Tuesday, Oct. 2, 2018 from 4:30–6:30 p.m. in the Lorne Watson Recital Hall. This two-hour workshop is one of many taking place on college and university campuses this academic year. Movies for Mental Health is a free workshop and pizza will be provided for attendees. The workshop consists of a facilitated discussion, viewing of three short films from the OLIVE Film Collection on the topic of mental health, and a community and campus resource panel connecting attendees with accessible mental health resources in the region. This event is open to students, staff, and faculty of the university as well as to community members. This event has been generously sponsored by Brandon Neighbourhood Renewal Corporation, Healthy Brandon, and the Suicide Prevention Implementation Network of Brandon. Art With Impact is a charitable organization that promotes mental wellness by creating safe spaces for young people to learn and connect through film, reducing stigma and connecting students to accessible mental health resources. To learn more, please visit www.artwithimpact.org or follow along at @artwithimpact / #Movies4MentalHealth.